3. Stiffer fabric. 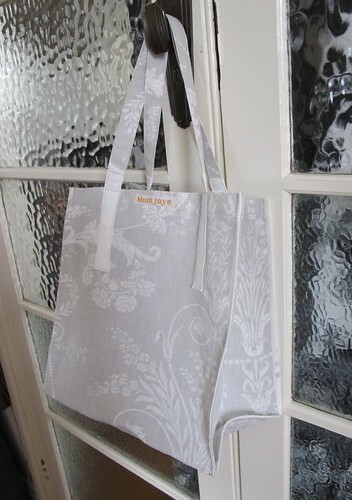 This is a pretty linen canvas (or so I conclude) remnant from Laura Ashley. Good fabric for the purpose. This folds nicely more easily too, which pleases me. 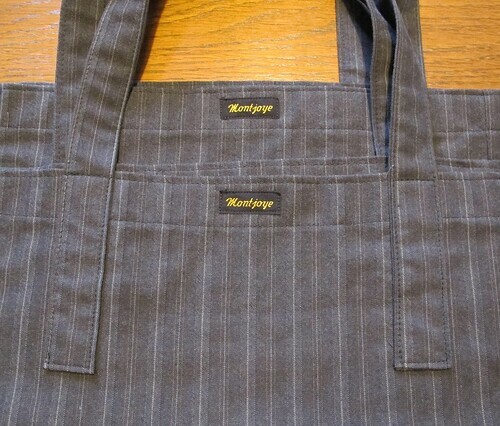 If I make the handles a cm shorter each side, the folding will work even better. 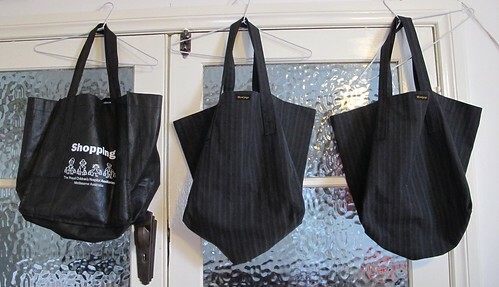 Hurrah, I have a workable pattern and several bags to be going on with. I’ve had a lovely time the last three days, working on making things out of quince for the first time. Back in June I bought some quinces. I’d been thinking on things that could be used to give character to cider made from boring commercial juice. 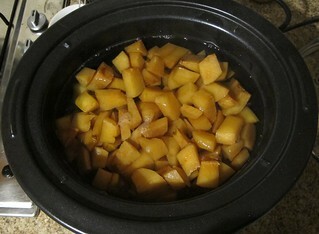 I got all excited when I thought of quinces! They are in the same botanical family as apples. I’m not alone in this thought. At least one of the Tasmanian cider houses makes a cider partly from quinces. So given we were just past quince season, I thought I’d see if I could still get some. Yes! I bought 4 crazy knobbly yellow quinces. Roughly peeled cored and chopped, rested in water until all were done. Gave 1.5kg (admittedly wetted) quince flesh. I put that in a bag in the freezer to begin the juice process. Then two days ago I took them out of the freezer, let them defrost a little on their own until the pieces could be broken apart. Put them into the slow cooker, added ~100g sugar (the last of the dextrose I had), a kettle of boiling water and a litre of cold. Left this cooking on slow for 10 hours. Yellow fruit flesh turned pink. 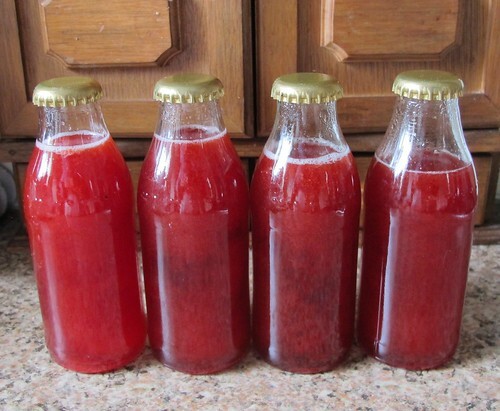 After juice extraction, I was left with about 500ml of pink quince pulp, less than a quarter of the original fruit volume. Yay, it stayed pink! Here’s hoping it tastes good too in a month or so after it’s had time to mellow. 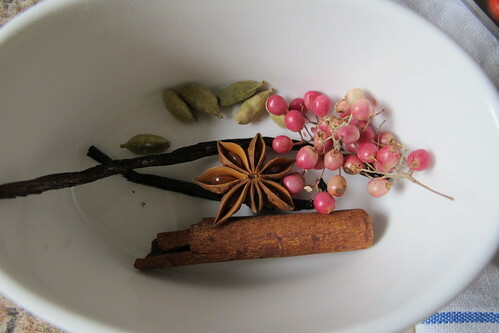 As is traditional in my kitchen, some of the mostly exhausted spices are doing last duty in stewed fruit for breakfasts. 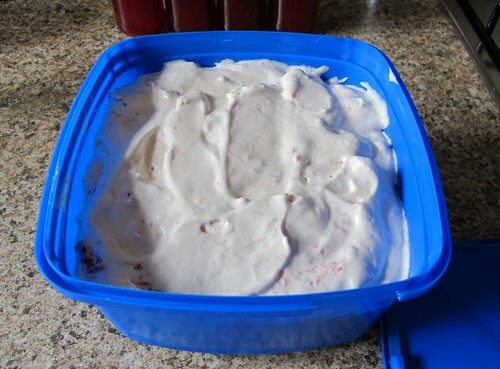 This is 4 large pears, half a punnet of strawberries, about a dessert spoon of sugar, half a glass of white wine and the vanilla and cassia from above. This isn’t fascinating but I’m still pleased to have done it. 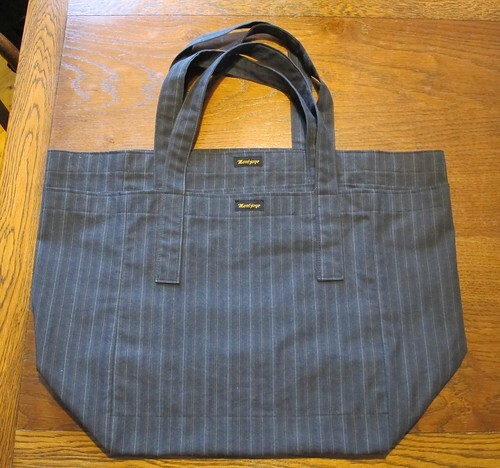 I’ve been meaning to replace my collection of synthetic shopping bags with cotton or linen ones. This is a good start. I like the shape of the supermarket issued ones, so I copied the measurements. Mine are floppier which might be a bit irritating in use. They sure feel nicer to the fingers though. The fabric is a brushed, dense cotton twill suiting left over from a pair of trousers. They look neater folded flat. I doubt this will happen often though. They may never look this neat again. I’m a little disappointed that I miss positioned one of the handles. Oh well. These are done with my first thought on construction. Front/base/back is all one piece for strength. There is an extra layer in the base for reinforcing. The sides are separate pieces. I have a few other different thoughts and plans to make a few more. Patterning and/or construction decisions might well be influenced by the shape of the fabric pieces. Of course I had to put labels on. It’s a while since I’ve posted food things here. Some of my more experimental recipes get recorded elsewhere. I suppose this blog feels like it’s becoming focussed on fabric, fibre and sewing. I’ll mix it up today with some food. It’s strawberry season here. I weakened and bought another three punnets a few days ago, so I had to decide on something to turn them into. I settled on a paired set of recipes where one uses the leavings of another, and happily consumes leftover ingredients I happened to have in the house. the vanilla pod left over from a brewing adventure. Bring all slowly to a simmer, take off the heat. Mash the fruit until it’s pulpy. 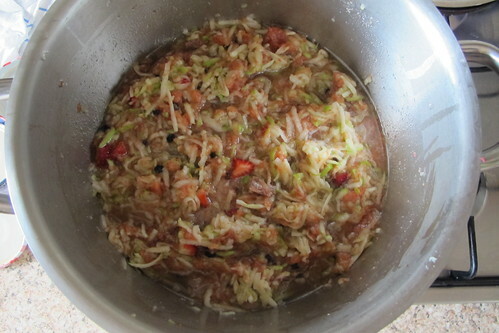 Put the lot through a sieve but don’t get too fussy about getting all the juice out. Put the pulp aside and chill it. 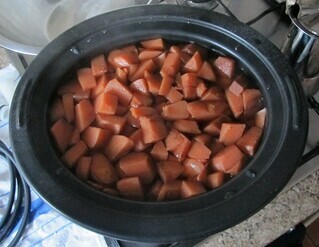 Put the juice back in the pan and bring back to a simmer for 5min. Bottle into sterilised containers. This made ~400ml. This is inspired by a Cassata recipe much loved by my family. It’s easy and tasty though one needs to be willing to eat uncooked eggs. I make lots of versions of this. Beat egg whites with the salt to firm peaks, slowly beat in sugar. Put aside. Beat cream until firm. Beat in egg yolks. Mix in strawberry pulp. Fold together with the egg white mixture. Freeze. One can stir it during the freezing so that it doesn’t set so hard, or just leave it and serve in slices. I knew I’d started Makkinschtuff about a year ago but I wasn’t sure quite when. Turns out that WordPress tells you, and the answer was yesterday. 113 posts, 2824 views in my first year here. So I’ve been posting about every 3 days on average. Not bad. I never promised or intended to post daily. Today then is a new blog year. 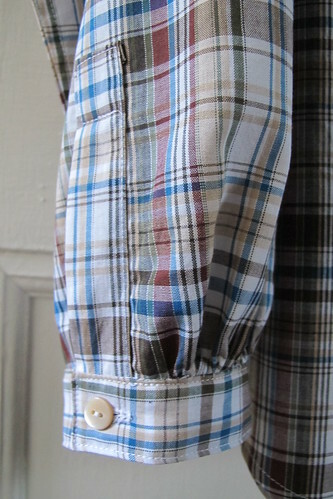 To celebrate, or just because this is where I’m at, I’ll show you the shirt I’ve just made on the new/old Bernina 830. The machine came home on Tuesday, running smooth and smelling of machine oil. I had therefore to take her for a spin. 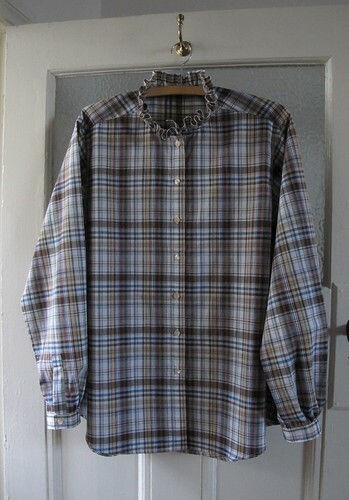 This length of fine cotton plaid shirting was washed, pressed and hanging in the corridor waiting. 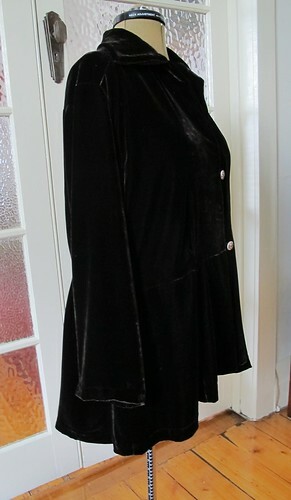 I bought it in a Christchurch opshop back in early February. Now it’s a shirt. 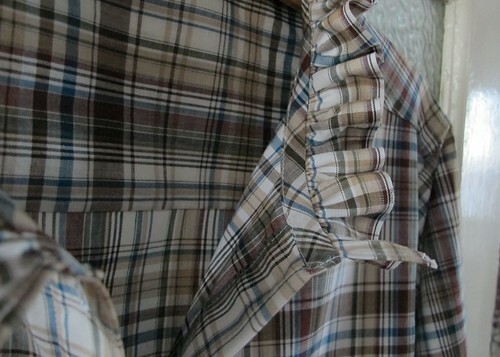 I thought the neck frill would soften the plaid and the plaid would soften the costumey effect of the frill. I’ll see how I feel about it in the wearing. 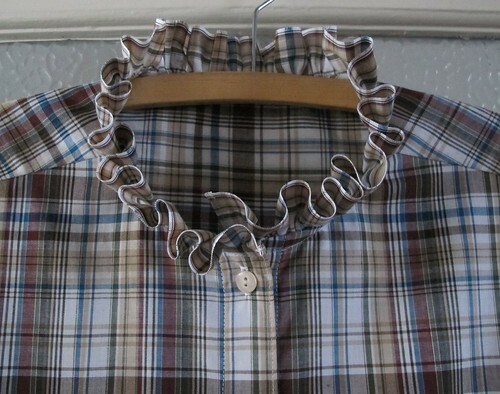 Instead of a collar stand, the frill is sewn straight onto the shirt neckline and bound with self bias. The cuff fullness is gathered to echo the neck frill. Buttons are of course shell, shiny caramel coloured this time to pick up the caramel stripe. The machine behaved beautifully. Maybe it was running even better by the end of the shirt? Maybe I was just getting used to it. I like the sound of it better than my 1230 but I sure miss the stepping motor. I’ll be picking up the 1230 later today after nothing more than a thorough service. I wonder how she will behave? I suspect some of the problems might recur, we will see. I’ve been wanting a new evening jacket and a big special birthday party gave me a good excuse to make one. 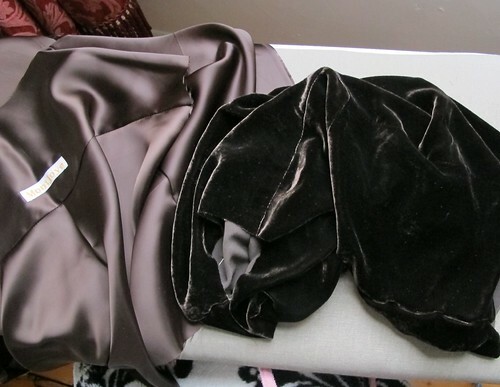 I had a piece of chocolate brown silk velvet in stash that I kept coming back to. It’s sombre but luscious. There was only 2 metres. Not enough for my first design thought that involved a handkerchief type hem. A redesigned version was manageable though. I figured that I needed to work with an existing pattern to get it done in time. 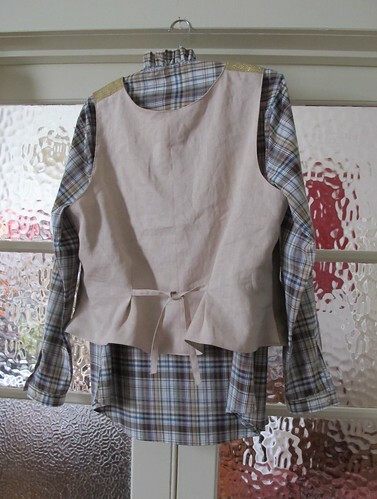 So this is my much used shirt pattern, cut short at waist level, with a few pleats for shaping and an eight gore peplum with a high low hem. The velvet behaved itself better than I expected and consented to be sewn by machine as long as the seam was pile to pile. Any joins that were pile to flat fabric were sewn by hand. 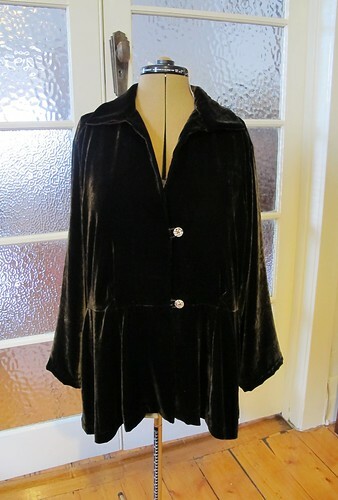 The lining is ultra slippery rayon satin. Gorgeous cloth to feel, really frustrating to work with. It wouldn’t stay on the ironing board, on my lap, on the sewing table. It just slithered off! Lovely to wear though now it’s trapped inside the jacket. 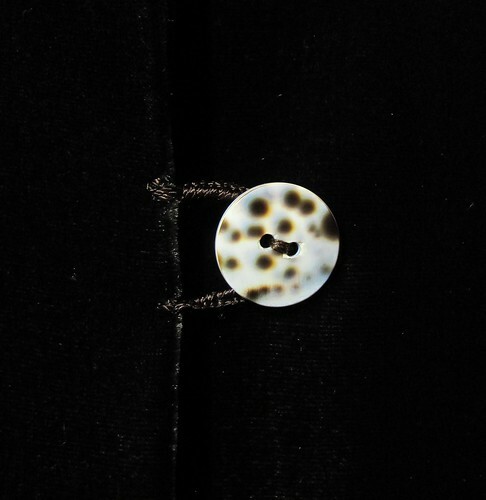 The buttons are shell again but with a difference. Cowrie shell this time, which have a bit of a leopard print look. 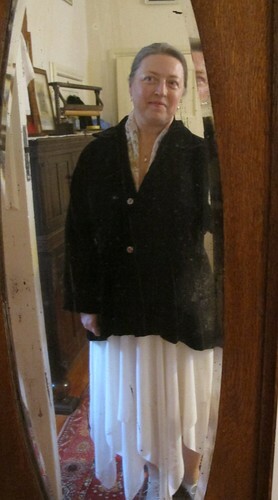 They also tie in the white dress I was planning to wear on the night. 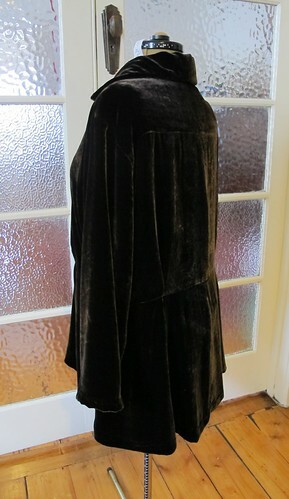 The button loops are done in a lovely vintage silk twist that a friend found a few years back. Here is a pic of it on. Of course there are a few mistakes and things I might do differently. Never mind, it’s wearable and rather lovely anyway. 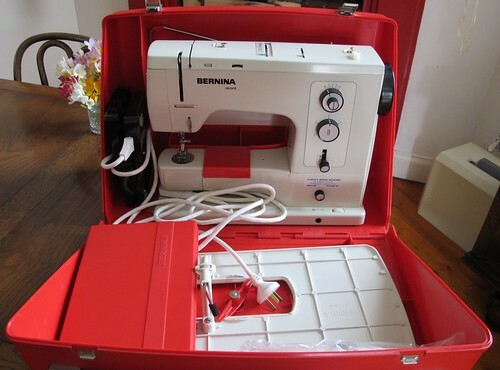 A sewing machine story, but a positive one this time. The 1230 is still in the fixit shop with no diagnosis as yet. Regardless of what happens with it, I decided that another quality machine was needed in my life, preferably one that isn’t subject to circuit board faults. I can’t keep the lovely loaned 1030 forever. 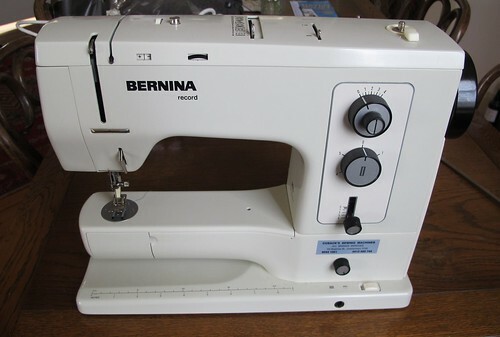 So I’ve been looking out for a Bernina 830. I think I wrote before that these are well respected. 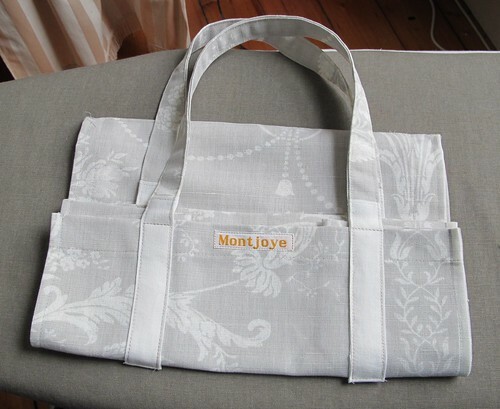 They are also familiar to me as I did a lot of sewing on my mother’s one in my teens and early 20s. I’d seen several for sale but the location was not ideal or they looked in poor condition. 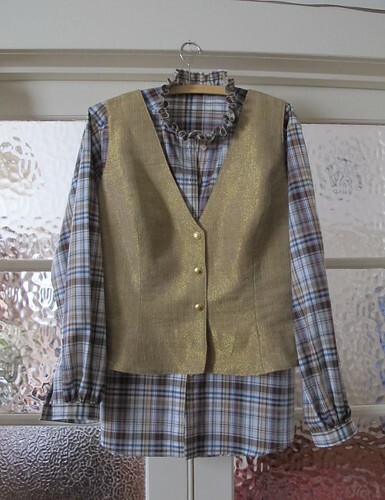 Then this one turned up on ebay. It was local, only a few suburbs away and claimed to be little used. The pictures looked pristine. Wonder of wonders, I won the auction! I picked it up this morning. The lady selling it said she had bought it in 1975 but barely used it. I got it home and yes, it’s in outstanding condition. The only problems I could see come from it’s long disuse. The sewing mechanism still runs, though with a bit more resistance than it ought. The presser foot mechanism is all gummed up though. After stuffing up the last machine I tried to work on, I decided such a jewel should be sorted by the professionals. So I took some photos and took it around to my local repair people. That was more fun than I anticipated. It’s always nice to be the source of the good kind of amazement. The chap I spoke to was astonished at both the good condition of the machine and the modest price I’d paid for it. Definitely raised eyebrows and excited voice territory. He confirmed what I had suspected, that if I happened to decide not to keep it, I could easily resell it and probably even make money doing so. He has had several customers looking for this model willing to pay much more than I did. Look how shiny. I did find a tiny bit of lint right under the feed dogs, but that was it other than the sticky old oil issue.